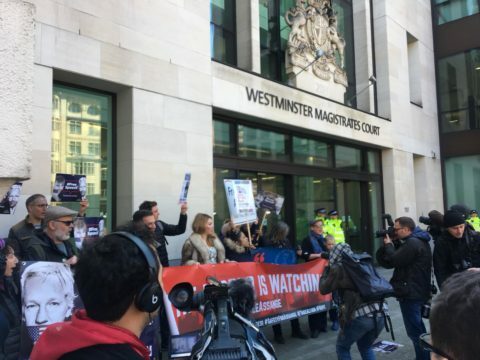 ARTICLE 19 is concerned by yesterday’s arrest of Julian Assange, founder and publisher of Wikileaks, on the basis of a US extradition request, detailed in the subsequent confirmations of the UK Metropolitan Police, UK Home Office, and the US Justice Department. The US Justice Department has said that the arrest was based on the “federal charge of conspiracy to commit computer intrusion for agreeing to break a password to a classified US government computer”. The charges relate to Assange’s work with whistleblower Chelsea Manning in 2010, which have since led to her imprisonment for 7 years, and ongoing detention under contempt of court charges for failing to testify in an investigation into Wikileaks. Originally, the UK authorities stated that they arrested Assange on the basis of having fled bail in the UK in 2012, related to an investigation into allegations of sexual assault in Sweden, and a linked extradition request.